GST ACT ensures that it lays more and more emphasis on its compliances and enforcement across all the areas including registration, returns, invoices ,etc. The terms Offences and Penalties are not defined in the GST Law. However, Offence in general means a breach of Law or Act or any illegal act and penalty is defined as the punishment for committing an offence. The provisions related to Offences and Penalties are covered in Chapter XIX , Sections 122 to 138 of the GST Act.The provisions of Penalty were there in the extant laws too i.e. Service Tax, Excise and VAT. > Falsification of Financial records or furnishing of false information, documents, etc. > Disposing off / tampering with detained / seized / attached goods. It may be noted that some of the above offences attract imprisonment too, term of which is based on the value of the tax evaded or input tax credit wrongly availed or utilized. In case of offence mentioned on s.6, 7, 10, imprisonment may extend upto 6 months. It may further be noted that the offences mentioned in S.1 to 4 and involving amount of tax evaded or input tax credit wrongly claimed greater than rupees Five Crore are cognizable and non bailable. A cognizable offence is the one where the authority has the power to arrest the accused without any warrant. 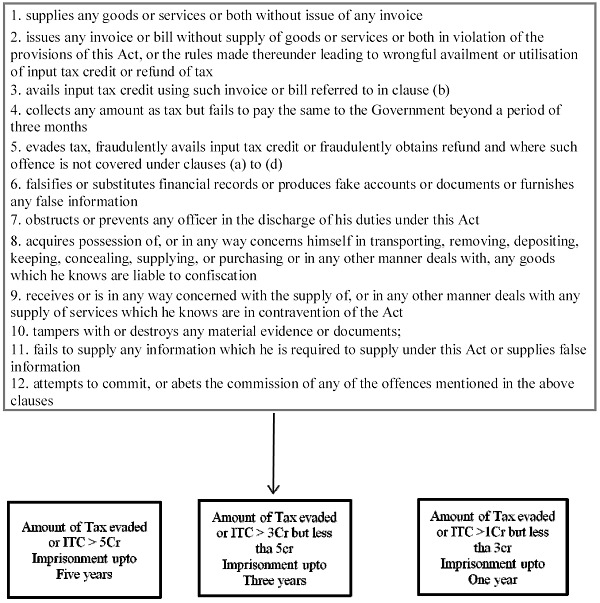 It may be noted that the amount of Penalty for similar offences under DVAT Act and Service tax are different ,for example, penalty for failure to apply for registration under DVAT Act is lower of Rupees One Thousand per Day or One Lakh Rupees, in Service Tax the penalty for failure to apply for registration is Rupees Ten Thousand , in case of ITC wrongly claimed in DVAT the amount of Penalty is the amount of Input Tax Credit wrongly availed or Rupees Ten Thousand, whichever is higher. Failure to pay tax along with returns –Bonafide doubt regarding the tax liability. Dealer disputed tax liability on the basis of judgement of the Apex Court, apex court later clarified conflicts on its own judgement. Assessee immediately paid the tax with interest, penalty not leviable. Here the assessee has supplied goods without payment of tax based on the judgement of the Apex Court and hence penalty was not justifiable. > No penalty shall be imposed for minor breaches (amount of Tax involved is less than Five Thousand rupees) of Tax regulations or procedural requirements and in particular, any omission or mistake in documentation which is easily rectifiable and made without fraudulent intent or gross negligence. > when a person voluntarily discloses to an officer under this act without the prior discovery by the proper officer. > The officer while imposing penalty under this act shall specify the nature of the breach and the section in which he is imposing penalty. In the said case, destination of Goods was shown as Lucknow whereas actually the goods were sent to Ludhiana. Explanation was given that by mistake code for Lucknow i.e. “LUC” typed in place of code of Ludhiana “LUD”. Assessee voluntarily reported the error and hence penalty cannot be levied merely by the deficiency in documents. It may be noted that penalty cannot be imposed merely on the information given by anyone without any evidence. In case of M/s Gupta Polymers v State of Haryana, it was held that imposition of penalty merely on the statement of driver ignoring accompanying documents not permissible. Movement of goods from Mumbai to Delhi in the course of import from Mumbai to Delhi under proper document , no state tax involved. On interrogation from the driver , he said that he was instructed to pass through the branch at Faridabad, but here the intention was to collect some household items of the manager. Hence, it may be concluded that penalty could not be imposed as the documents were in favour of the assessee. > fails to issue any invoice for a supply or account for any invoice in his books of accounts. Section 123 prescribes the penalty for failure to Furnish information return required under section 150, in such cases the penalty shall be Rupees Hundred per day subject to a maximum of Five Thousand rupees. Section 124 prescribes the penalty for failure to Furnish information or return required under section 151, or furnishing of Information which is false per the person. In such a case the amount of Penalty shall be maximum Ten Thousand Rupees.In case of continuing offence, the amount of penalty shall be Rupees hundred per day subject to a maximum of Twenty Five thousand rupees. There may be some offences which are not being covered by any of the previous sections and the penalty in such case may extend upto Twenty five thousand rupees. It may be noted here that the government has the right to waive penalty, either fully or partially for such class of tax payers and under such circumstances as may be recommended by the council. 1. In case Assessee comes forward:- Penalty shall be Hundred percent of the Tax. In case of exempted supply, the penalty shall be Two percent of the value of goods or Twenty five thousand rupees, whichever is less. 2. In case Assessee does not come forward:- Penalty shall be fifty percent of the value of goods reduced by the tax already paid. In case of exempted supply, the penalty shall be five percent of the value of goods or Twenty five thousand rupees, whichever is less. If the assessee has not paid the tax and the penalty , he may furnish a security for the amount equivalent to the tax and penalty for getting his goods released.The order for detention of goods must be passed before actually detaining the goods. Also, penalty shall be imposed on the person under section 122.It may further be noted that the Adjudicating officer shall give the owner the option to pay fine in lieu of confiscation. The amount of fine in such a case shall not exceed the market value of the goods. The law has further clarified that the confiscation or penalty shall not interfere with other punishment that may be inflicted on the concerned person. Section 133 deals with the provisions related to the liability on the officers. It states that any person engaged in connection with collection of statistics under section 151 or compilation or computerization thereof shall not disclose the information to anyone. In case of breach of the duty the person shall be liable to penalty which may extend to Twenty Five Thousand rupees or with imprisonment upto six months or both. To avoid the time and the cost involved in the prosecution , Commissioner has been granted power to compound the offence( section 138).It may be noted that compounding can be done either at the time of , or before the prosecution , on payment of the compounding amount that shall be determined in the manner prescribed. All the proceedings shall stand abated once the Compounding is done and no further action is required to be taken by adjudicating authority.